Like pumpkin in the fall, strawberries in the summer, and peppermint in the winter, flavors do a great job of connecting you to a place and time. This happens especially during the holidays as we go in search of the things that remind us of, and help us to recreate, traditions of yesteryear. Though Christmas in North America is spectacular, for me, nothing beats a Caribbean Christmas. My cupcake experimenting this season yielded a unique cupcake flavor (pictured above) that I can only describe as a Caribbean Christmas and cupcake fusion. While the term fusion is well used in a variety of settings these days (example: Asian Fusion Restaurants) the word fusion actually has a place in science. Similar to its general definition, fusion in science, or a fusion reaction, is the combination of multiple atoms after collision at extremely high speeds, to create a much larger one. However, after a fusion reaction, the mass of the larger atom turns out to weigh less than the sum of the smaller atoms combined. The weight that is lost is actually expelled as energy. We’ve all seen the Einstein equation which was spun off of his theories of relativity: E=MC2 where E is energy, M is mass, and C is the speed of light (186,000 miles per second). Believe it or not, this equation communicates exactly what I explained above: at extremely high speeds the mass lost after a fusion is equivalent to the energy produced! Want to hear Einstein explain it himself? Click here! So what does this have to do with my cupcakes you ask? Well, in this Christmas concoction I collaborated rum and wine soaked fruits used in West Indian Black/Fruit Cake (a traditional Christmas sweet in the Caribbean) with delicious, refreshing sorrel drink (a traditional Christmas drink in the Caribbean, made from a perennial herb that flourishes in November and December.) The combination of these two elements resulted in the fusion of flavors that truly express the energy and vibrance of the Caribbean, especially at Christmas. 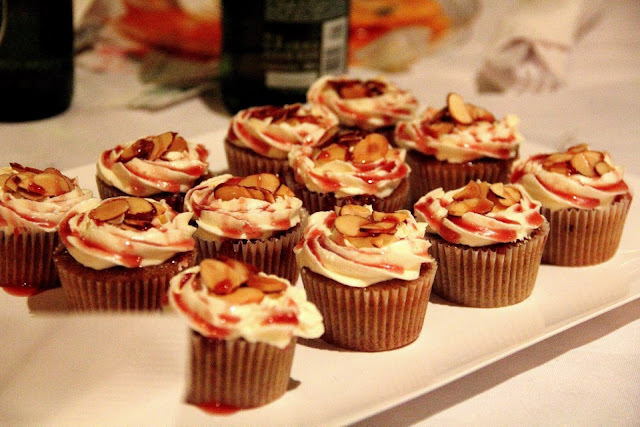 A sorrel fruit cake, with almonds, injected with sorrel syrup, covered with almond buttercream, topped with toasted almonds and drizzled with more sorrel syrup. Here's how it's made! Preheat over at 350 degrees. Mix oil and sugar (for dairy-free recipe) or beat butter and sugar until fluffy. Mix in eggs one at a time with a mixer on medium speed. 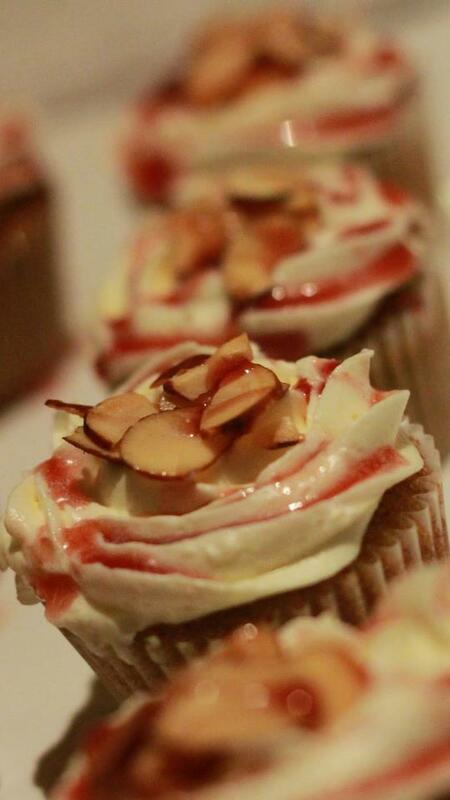 Add vanilla and almond extracts. In a bowl combine flour and five spice powder and sift. With mixer on low, fold in 1/3 of the flour and spice mixture. Add in 0. 5 cup of unsweetened sorrel drink and 0. 25 cup of pureed fruits. Once uniformly blended, add another 1/3 of the flour mixture followed by the remaining sorrel drink and fruit. Add final 1/3 of flour and mix in almonds. (Note: though the sorrel is red the batter does not turn red, batter will look very runny. Cupcake pen comes in handy here!) Fill lined cupcake pans and bake for about 25 minutes until a tester inserted come out clean. Add sorrel drink and sugar to a saucepan on stove at medium to low heat. Over the heat, swirl the pan to dissolve the sugar in the sorrel drink completely. As mixture heats up it will begin to bubble. When bubbles appear, swirl pan over the heat in a circular motion to reduce bubbling. Continue this process every 2 minutes until mixture begins to thicken to a clear syrup consistency. Allow to cool and pour into a condiment dispenser for drizzling. I haven't come up with a name for this cupcake yet, but if you have any suggestions please leave them in the comments below. Hi I just lucked up and found this site and I’m so grateful ! 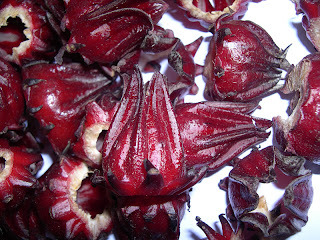 The sorrel drink I have used allspice when I did’nt have ginger and it was great. You may want to try share this! God Bless! Thank you Adler! So glad you enjoyed this post! I sometimes use a little ginger powder in my sorrel. But not everyone is into the powerful ginger flavor so I guess it depends on who's going to drink it right? :) Thanks for the allspice suggestion too! All the best! Your contribution and comments to this experiment is a great catalyst. Thank you for your participation!